Polish convert to Christianity; born 1663 at Zolkiev. He was a learned rabbi, and traveled as a maggid in Poland and Germany, preaching in the synagogues. In Holland he remained for seven years teaching rabbinics at Leyden. He thus became intimate with Trigland, through whose influence he was converted to the Reformed Church, as Margalita himself relates in his work "Oblatio Aaronis seu Tractatus de Passionibus Christi," Frankfort-on-the-Oder, 1706. Disappointed in his hope of receiving support which would enable him to study for an academic career, he left Holland and went to Berlin. Here he denounced the Talmudic Haggadah as containing blasphemies against the Christian religion, whereupon King Frederick I. of Prussia ordered that the copies of a new edition of the Midrash Rabbah, which had been published at Frankfort-on-the-Oder in 1705, should be placed under seal until the Christian theological faculty of that city should render an opinion upon the work. This opinion being favorable, the order of suspension was revoked and the sale of the book was permitted. 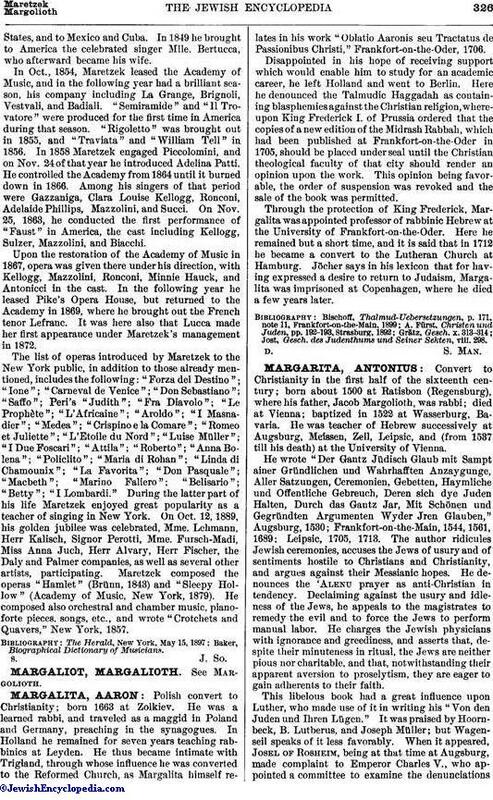 Through the protection of King Frederick, Margalita was appointed professor of rabbinic Hebrew at the University of Frankfort-on-the-Oder. Here he remained but a short time, and it is said that in 1712 he became a convert to the Lutheran Church at Hamburg. Jöcher says in his lexicon that for having expressed a desire to return to Judaism, Margalita was imprisoned at Copenhagen, where he died a few years later. Jost, Gesch. des Judenthums und Seiner Sekten, viii. 298.